If your baby is ready for some fun in the sun and some time in the water, then you are going to want to make sure that you buy the best baby pool float possible. You’ll want one that doesn’t restrict your babies movements in ways you don’t want but also keeps them safe. Which is why you’re probably going to do a little bit of research on the matter. Baby floating devices have come a long way since water wings were first introduced. Now they come in a variety of different styles and configurations. You can find ones that just keep the baby afloat—like water wings—but you can also find ones that try to entertain the baby as well. So it’s important to choose one that you feel is right for your baby and suits his or her particular needs. In this article, we’re not only going to introduce you to the best baby floaties that are currently available but we’re also going to give you some tips on buying them. So, if you and your baby are ready to hit the pool, then pull up a chair and we’ll give you the 411 on which infant pool float to buy. 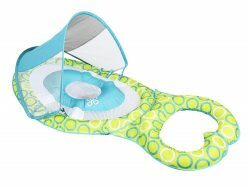 The Swim Way Activity Center with Canopy is a baby pool float that not only comes equipped with toys that the baby can play with while they’re in the pool but also comes with a number of features which make it safer. It has a large circumference with dual air chambers and an inner spring and a canopy that provides up to 50+ UPF protection for the babies head. Some of the activities that can be found on this device include a tether, stacking rings, a rattle and a squeaker. It’s a great floating device for children from 9-months old to 24-months old and is a great float to introduce your child to the wonders of the pool. Designed to be used by babies 9-months to 24-months old, the Swim Ways Baby Spring Float is a great device for introducing babies to their first dose of aquatic fun. It’s a large circumference float that covered in fabric and has numerous safety valves and air chambers to keep baby safe. It also comes with a patented inner spring that gives the device more stability than other floating devices and keeps it from flipping over in the pool. Other features of this floating device include a soft mesh seat that has leg holes built into it so baby can enjoy kicking underwater and a nice bright design that visually stimulates the infant. It’s a nice product that will keep your baby safe as you introduce them to the joys of swimming. Known for creating a variety of above-ground pools, toys, boats and air beds, Intex Recreation Corp. has now turned their attention to making pool floaties for children with the 59574EP floating device. This inflatable device expands to a diameter of 36-inches and has two air chambers for safety. This large ring is also equipped with a smaller inner ring that makes the whole device more stable and a lot safer. Other features of this inflatable pool float include seat straps and a pillow backrest. It can be inflated in minutes and is good for all-day fun-in-the-sun. Parents can rest assured that it will help keep their baby safe while their baby is enjoying pool time. One of the coolest, as well as most nerve-wrecking, experiences that any parent can have is introducing their child to the water for the first time. Fortunately, the Swim Ways Baby Spring Float makes it a lot easier to make that introduction. 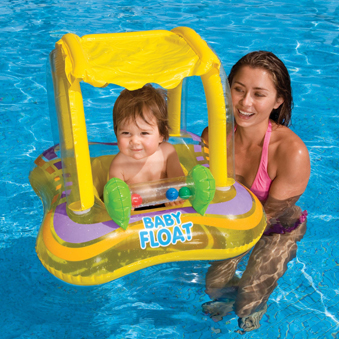 This float is made for babies age 9-months to 24-months old and has a number of features that make water time safer. This includes dual air chambers and safety valves that make this float safer, a lower center of gravity for more stability and a removable sun shade to protect baby from the sun. Other features of this device include a soft mesh seat and a play area that can be used for playing with water toys. And when it’s not in use, it can be easily folded up and put away. Swim Ways, a trusted brand in the child pool float industry, has done it again with this baby spring float. It has a removable sun canopy that provides UPF 50+ protection to protect babies head against the damaging rays of the sun but the canopy has see-through sides so parents can keep an eye on baby at all times. This float also has dual inflation rings and an added ring that keeps the device stable in the water. Other features of this floaty is a soft mesh seat that keeps baby comfortably seated and a small play area that baby can use for splashing or for playing with toys. It’s designed for babies 9-months to 24-months and can be folded back to its original packaging size so it can be inserted into a storage bag. Designed to look like a pink flamingo, this swim ring float is a popular float for children aged 8-months to 24-months old. It is a float that can help parents introduce their babies to the water for the first time and can be a great introduction to teaching them to swim. This device’s whimsical and fun loving design also makes it fun for baby to play with—whether they are splashing around the pool or are on dry land. And when it’s done be used, it easily deflates so it can be put away and stored. It’s a float that both parents and children love. One of the first steps in baby learning to swim is their introduction to the water. A process that can be scary if not properly done. Fortunately, the Swim Ways Infant Spring Float can help. This inflatable flotation device has features that not only make it safer to introduce baby to the water but also make it more fun. Some of the key features that can be found in this product include child safety valves and dual inflation chambers for added security in the water, an innerspring around the edge of the device for added stability and a 3-point harness system to keep the baby in it. It also has built-in handles that can be used by parents to steer the float through the water. One of its most important features, however, is its removable canopy which provides 50+ UPF protection against the sun. The Intex Stingray looks more like a tiny fun house than anything else but parents can rest assured that this is actually a flotation device with a fun aquatic shape to it. It has a dual air-chamber design with a canopy to shade the babe and an inflatable handlebar. It is made for children age 1-year to 2-year old and has 2-leg holes so that the child can easily sit in the device while in the water. While it may not have all of the additional safety features other flotation devices may have, with proper supervision this float is a great way to introduce the child to the fun of aquatic play. This swimming ring and flotation device are designed to not only keep baby safe in the water but to also provide them with something to do at the same time. It’s made from environmentally friendly PVC that is leak-resistant and is in the shape of a boat—even coming with a steering wheel that the child can play with. This device can be easily inflated and has a shade canopy designed to keep baby’s sun exposure down to a minimum. And when the day of swimming fun is over, this float can easily be deflated so that it can be stored away. When most people think of the Speedo brand, they tend to think about swim shorts and swimwear and not necessarily flotation devices, yet they do make one called the Kid’s Begin to Swim Baby Cruiser. This device is made with dual air chambers for added durability, stability and safety, but is also covered in a soft fabric which makes it more comfortable for baby. And to protect the child from the intense rays of the sun, this float also comes with a canopy that can be added or removed as necessary. It’s a decent flotation device that can be easily deflated when it’s not in use so that it can be stored away for the season. Flotation devices for babies come in a variety of different shapes and designs. Some of them are more playful and some of them are more purposeful. However, what the float looks like isn’t the most important thing to look for in one of these flotation devices. In fact, it’s not even one of the top three things parents should be looking at when it comes to these kinds of floats. The top three considerations that really need to be considered are safety, size and sun protection. You’ll want to find one that can satisfy all three of these criteria, so let’s take a look at each of them individually. The first thing that needs to be considered is safety. You’ll want to purchase a float that has a few particular safety features built-in. Some of the features that should be considered include safety valves and dual inflation chambers which help safeguard against air leakage or the device suddenly bursting and deflating. You should also look for inner springs and a low center of gravity which make the flotation device more stable and less likely to flip over. However, it needs to be noted that all of these safety features are not a substitute for the biggest preventative measure: parental supervision. Children should always be supervised while using ANY flotation device. Size is another important factor to consider. Choosing a model that’s made for your child’s age group will ensure that the device is not only comfortable for the child to use but is also safer for the child to use. Don’t try to put your child on a float that’s made for a younger or older age group. There are some devices which are made to be used by a range of different age groups but usually, these floats lack the safety features that age-specific models offer. While many pediatricians will recommend that babies under the age of 6-months old should be kept out of the sun, it’s usually advisable to keep older babies out of direct sunlight as well. After all, a baby’s skin is super delicate and research has shown that early childhood sunburns can increase the chance of skin cancer later in life. So you’ll want to make sure that you buy a float with some kind of shade and preferably one that provides UPF 50+ protection or higher. Just keep in mind this in mind: just because a float has a shade it doesn’t mean that shade offers UPF protection, so unless it specifically says it offers such protection, then assume it doesn’t. Here are a few more things to consider when it comes to baby pool safety. Follow these tips and you can make sure that your baby is as safe as possible in the pool.